i’m as wary as anyone else when i hear “best” attached to something- the best pastrami (this title belongs to katz in nyc but i’m willing to listen to closer suggestions), the best coffee, the best whatever. but these best blueberry muffins are really good. the topping is crunchy and lemony, and the muffins are so tender and packed with berries. 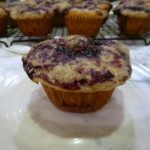 they do take some time, but i swear they’re worth it, as evidenced by the fact that this is my 3rd time making this recipe and that i haven’t made any other blueberry muffin since finding this one. they’re best warm, with a cup of something hot (i’m always down for some earl grey or english breakfast, or even green even though that’s kind of weird), eaten with a person who will hopefully do all the dishes for you because there are a lot. i won’t lie. i’ve made some slight modifications. instead of using fresh blueberries for the cooked down swirl, i used frozen. i find that the frozen costco berries are quite flavorful, and they’re a lot cheaper than fresh berries. you can do all frozen if you want; it works either way. it might not seem like it will when the berries bleed into the batter and make it that ugly gray/blue, but don’t worry. chris kimball and co. (update 11/16/15: chris is leaving ;__; i’ll miss him always failing jack’s taste tests) want you to succeed. i also cut down on the sugar in the muffins from 1 1/8 cups to 1 cup. america’s test kitchen says to transfer the compote to another bowl; there’s no need to, unless you’d like to torture yourself washing more dishes. or if you want, you can use blueberry jam instead of cooking down your own compote to cut back on time/energy/dishes. the muffins will definitely be sweeter, so be a bit wary of doing this if you tend to like lightly sweetened things. atk also notes that the batter will be very lumpy and that the batter will mound in the cups; both are true, so don’t freak out if the batter looks nasty or the cups seem too full. the resulting muffins are huge, and might scare away a more timid person, but i believe in your muffin consuming abilities. they’re super moist on the inside, with a really crunchy edge and top. the edge gets browned and crunchy, and the top owes its deliciousness to the fragrant lemon sugar. there’s a hint of lemon, and a ton of blueberry. you’re welcome. These blueberry muffins are studded with blueberries like any other blueberry muffin out there, but they also have a blueberry compote swirled throughout and are topped with fragrant lemon sugar. More work, but oh so worth it! Mix the sugar and zest together until the sugar is moistened. Bring 1 cup berries and 1 tsp sugar to simmer in small saucepan. Cook, mashing and stirring berries frequently, until berries have broken down, mixture is thickened and reduced to 1/4 cup, about 6 minutes. Cool to room temperature, 10 to 15 minutes. Whisk dry ingredients in large bowl. Whisk 1 cup sugar and eggs in medium bowl until thick and homogeneous. Slowly whisk in the fat until combined. Whisk in buttermilk, lemon zest (if using) and vanilla until combined. Fold wet mixture and remaining berries into flour mixture until just moistened (lumpy is fine). If the batter seems loose, let it mellow for 5 minutes (and start on those dishes, sigh), and it will thicken up. Divide among 12 greased muffin cups (batter should completely fill cups). Spoon 1 tsp cooked berries into center of each mound; gently swirl into batter using a toothpick and a figure-eight motion. Sprinkle lemon sugar over muffins. Bake at 425F until tops are golden and just firm, 17 to 19 minutes. Cool in muffin tin for 5 minutes, then transfer to wire rack and cool 5 minutes before serving. Adapted slightly from America’s Test Kitchen. You can use frozen or fresh blueberries, or a mixture of the two. If using frozen berries for compote, no need to thaw. 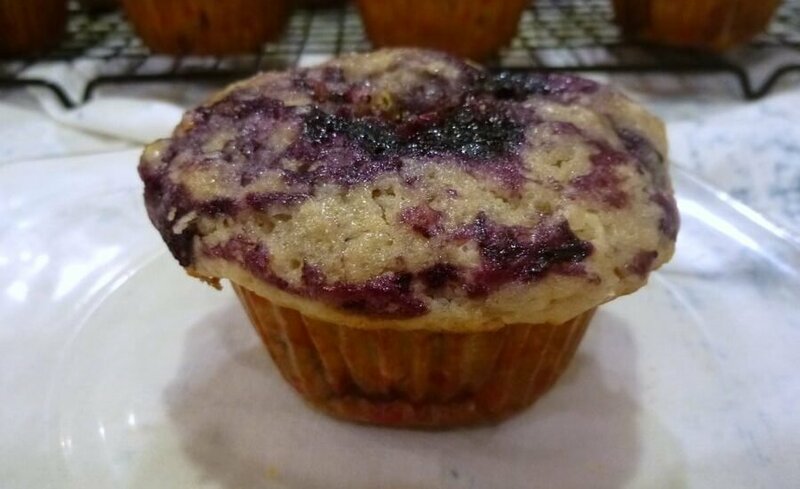 If using frozen berries for folding into muffins, make sure you thaw and drain the extra liquid so that the muffins don’t get gummy. thanks! and same; had some blueberry chocolate chip pancakes today and they made me very happy.